Family-owned and operated since 2000, Essential Formulas Incorporated (EFI) markets Dr. Ohhira's Probiotics® Professional Formula. A combination of ancient fermentation skills and modern science has created a powerful formula that provides complete support to balance the intestinal environment. EFI has expanded its line to include REG'ACTIV™ containing ME-3, the glutathione generating probiotic which facilitates the body's production of the "Master Antioxidant" needed for healing. For the seventh time, Better Nutrition Magazine chose Dr. Ohhira's Probiotics® innovative formula, from Essential Formulas Incorporated (EFI), as 2015 "Best of Supplements" Award Winner in the Probiotic Category, making Dr. Ohhira's Probiotics the only probiotic supplement ever to achieve this honor. In Japan, the number seven (7) is regarded as lucky and holy, and in the Bible it symbolizes physical and spiritual completeness, and positive renewal, so the 7th "Best of Supplements" award designation corresponds significantly to Dr. Ohhira's probiotic formula. Renowned and respected for replenishing good health, Dr. Ohhira's Probiotics originated from a reverence for nature. It all begins with an abundance of fresh herbs, fruits, mushrooms, vegetables, and spring water. A diversity of bacterial strains are added and encouraged to flourish through the patience of a multi-year natural temperature fermentation process that produces a remarkable probiotic. Better Nutrition presented the 2015 award during Natural Products Expo East held in September 2015 in Baltimore, MD. Winners were selected from a tally of retailer surveys, votes from readers and staffers, and input from The Better Nutrition Supplement Advisory Board which consists of naturopathic physicians, health writers and nutrition educators who considered the quality of ingredients, reputation and the science behind the nominated products. Iichiroh Ohhira, PhD, one of Japan's leading microbiologists formulated this product, and over 30 years of univer- sity-based, scientific research studies have proven it to be strong, safe and effective in dealing with digestive distress. Established in 2000, EFI is the sole distributor of Dr. Ohhira's Probiotics products in the U.S. Available from Dallas-based Essential Formulas, REG'ACTIV™ is a revolutionary probiotic that boosts glutathione, which scientists call the "Master Antioxidant" because it is vital in supporting the health of cardiovascular tissue, maintaining a healthy immune system, and promoting healthy liver function. Every cell in the human body uses glutathione to maintain cellular health. Your patients need optimal glutathione levels but it is difficult to supplement this antioxidant — research indicates glutathione breaks down during digestion. The REG'ACTIV formula combines Lactobacillus fermentum ME-3 with other established condition-specific ingredients, synergistically delivering the antioxidant benefits directly into diverse body systems. In 1995, award-winning microbiologist Marika Mikelsaar, MD, PhD and her team of research scientists at the University of Tartu in Estonia isolated a distinctive probiotic strain, Lactobacillus fermentum ME-3, able to produce glutathione. ME-3 is considered by scientists to be a "complete glutathione system" due to its ability to produce glutathione via 3 different mechanisms: it synthesizes glutathione itself; it extracts available glutathione from its surrounding environment; and it recycles oxidized glutathione back to its active state, allowing for cells to address typical day-to-day exposure to toxins and free radicals. Twenty years of ongoing research has proven ME-3 to promote healthy glutathione levels, thus providing powerful antioxidant support which in turn promotes overall good health and healthy aging. All three REG'ACTIV exclusive formulas contain ME-3 and condition-specific ingredients for synergistic health-promoting benefits. For a second time, Clean Eating Magazine announced Dr. Ohhira's Essential Living Oils™ as a "Clean Choice Award" winner. "With more and more companies working to create clean and healthy packaged products and supplements, we feel it's important to reward their innovation and service to healthy eaters living a clean lifestyle," said Alicia Rewega, editor-in-chiefÂ of Clean Eating Magazine. "In every way, clean eating is all about consuming whole food and supplements in its most natural state, or as close to it as possible." 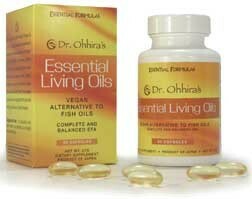 Dr. Ohhira's Essential Living Oils offers a vegan certified option providing balanced Omega-3, 6 and 9 ratios that serve as a complete and balanced source of essential fatty acids. In response to the common Omega-6 imbalance, the American Heart Association recommends regularly consuming fatty fish to promote a healthier Omega-3 intake. However, an increasing number of consumers are looking for alternative sources of EFAs, due to issues of personal taste preference or vegan lifestyles. Clean Choice Award winners were selected on the basis of planet-friendly packaging; life-simplifying power; current and cutting edge, simple, real food ingredients; high score by the Environmental Working Group's (EWG.org) screener; availability and accessibility; and being organic, sustainable, and GMO-free. "Eight natural plant and seed oils are carefully extracted and prepared to provide a pure, undamaged form of plant-based "good fats" for optimum health. The product is a scientifically designed blend of Linolenic Acid (Omega-3), Linoleic Acid (Omega-6), and Oleic Acid (Omega-9) delivered in the preferred ratio of 4:1:1, a great start for balancing the daily intake of healthy fats," said Muneaki Takahata, PhD, scientific researcher at BioBank Co. and Science Advisory Board Member for Dr. Ohhira's Probiotic Formulations.